Wouldn’t it be nice to come home to a house that’s not only beautifully decorated but also well-illuminated? A simple home can improve dramatically with the help of lighting design. Lights should not be just a boring bulb or lamp. It must be something nice to look at, a conversation starter, and should go with your house’s design or theme. 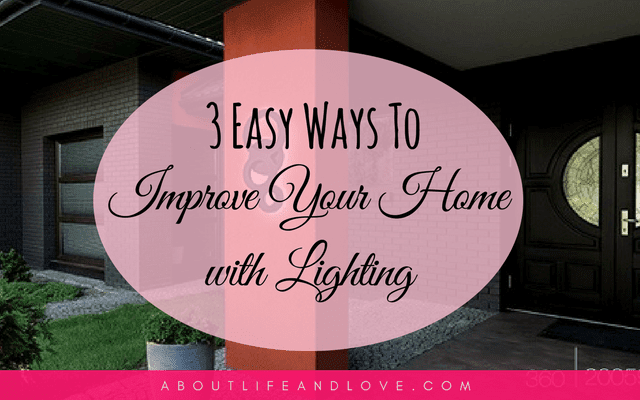 There are 3 easy ways to improve your home with lighting I want to share. Start with the outdoor light. The first thing you see when you get home and what would welcome your visitors is your outdoor light. Get a bright and beautiful welcome with an access outdoor wall lighting. Get one that creates a dramatic effect and will set the mood right. If you check out websites like Lighting Miami, they have outdoor lights made from different materials like metal, steel, and aluminum, as well as finishes like bronze, silver, and pewter. So you can choose which one goes best with your outdoor designs. Outdoor wall lighting comes in different designs too that can be used around garage doors, along privacy fences, and on entry gates or posts. Hey, it’s your home, you design it the way you want it. What can improve your ceiling light with drama and character is semi flush mount light. It’s a mix between a flush mount and a pendant type fixture. They are generally close to the ceiling, but the shade is suspended from the base by 1 inch or more by a decorative rod or rope. This kind of light will be not just be the center of the room but will also surely become the center of attention. An essential part of the house is the bathroom. They say it’s also called comfort room because it’s where you go to when you’re uncomfortable and needs some “comfort”. Linger a little longer in the bathroom by making it more appealing to the eyes and adding warmth to it. Have bathroom vanity lighting that can transform your bathroom into your personal sanctuary; a space that reflects your personality and indeed comforting for anyone who wish to enter. There are many other ways to improve your home by adding accent. It’s all in the details as the expert says. You can make your home more dainty, more interesting, and more attractive or what the Millennials refer to as Instagram-worthy or Instagrammable. All you need is to bring out your creativity, a lot of planning and researching and a little help from people who are experts in making any place beautiful. Lighting Miami gives you options after options in making lovely spaces even more beautiful with their lighting designs. I like to keep things simple. My ideal house is that which is not only aesthetic but also functional. I don’t want to add an item if they don’t add value to it. It must be both decorative and useful. A light is not just added to gather dust or grime. They can make the house brighter, more beautiful, and better. So a beautiful lighting is a must. Photos from Lighting Miami site. Your post arrived in my stream at the ideal time. As you know, I just finished moving into a new residence, a house built in the 1990s. The place we left behind had large windows and the rooms were bright with sunlight. Our new place is much darker and we are looking into ways to add light to all of the interior rooms. Your suggestions come in handy. Tasteful, fashionable lighting can work wonders for the look and feel of your home and elevate your mood as well. Lux, I want to thank you for visiting my blog twice during my month long absence. You are a great friend. Have a wonderful weekend! Lux, this is good advice. I'm big on lamps and the coziness feel. Definitely outdoor lighting too!